« Ravens Bidding Permanent Farewell to Westminster? 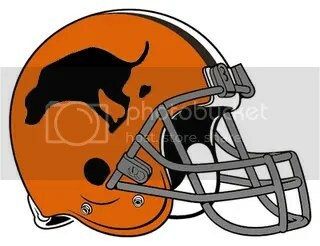 It’s bad enough that one team in the AFC North can only afford to put logos on one side of their helmet. In today’s football world, that crap doesn’t fly any more. Look at college football…teams like Oregon and Maryland come up with something new and beautiful/hideous every week. Even such sacred looks as the Notre Dame “golden domes” got spiced up a bit in 2011. 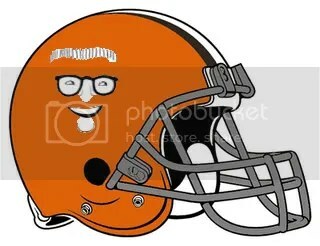 In that spirit, we think it’s high time the Browns get with it and jazz things up. We even have a few suggestions! Variations of this next one were suggested by just about everyone we polled on Twitter (@BMoreBirdsNest), including @B_MoreFanatic, @Spradlinn, and @mikehen08. 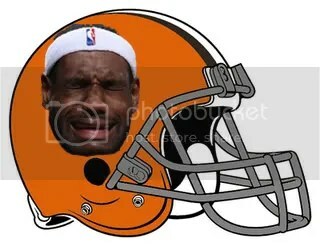 But when you think about it, what would get Cleveland fans more fired up than seeing a sad LeBron James face on their teams’ uniforms? Hell, it would be a great distraction from the Browns’ play on the field. This entry was posted on December 1, 2011 at 9:25 am and is filed under Hating, Humor, Ravens. You can follow any responses to this entry through the RSS 2.0 feed. You can skip to the end and leave a response. Pinging is currently not allowed. I like how there’s not even mention of the fact that the Ravens, in fact, are,the browns. Aren’t the ravens pretty much wearing browns helmets with logos? Sigh…too stupid to address, but I’ll bite. 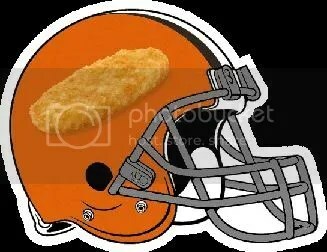 The Ravens aren’t the Browns. The Browns are the Browns. The Ravens are the Ravens. If you’re too dense to understand that, I don’t know what else to tell you. The Browns have orange helmets, and the Ravens have black helmets with logo stickers soo….not sure where you’re going with that one either. Feel free to keep saying dumb things though. I think he is just jealous of the fact that the Ravens (or as he calls them, the Browns) are a successful franchise in BALTIMORE and the real Browns (in CLEVELAND) are a terrible franchise and never win anything. It probably helps him sleep at night thinking the Ravens are, in fact, the Browns. But hey, you got to do what you got to do, I’m not knocking it. I was thinking instead of Carey’s whole face just his eye–wear but with the broken tape job in the middle. 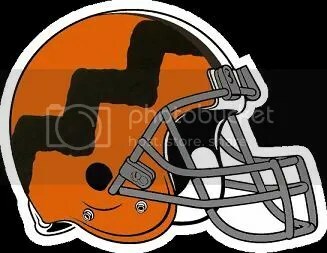 Or the Cleveland Brown Cracks …instead of Pittsburgh yellow stripe down the middle they have a dark brown “skid-mark” going verticle down their helmets.